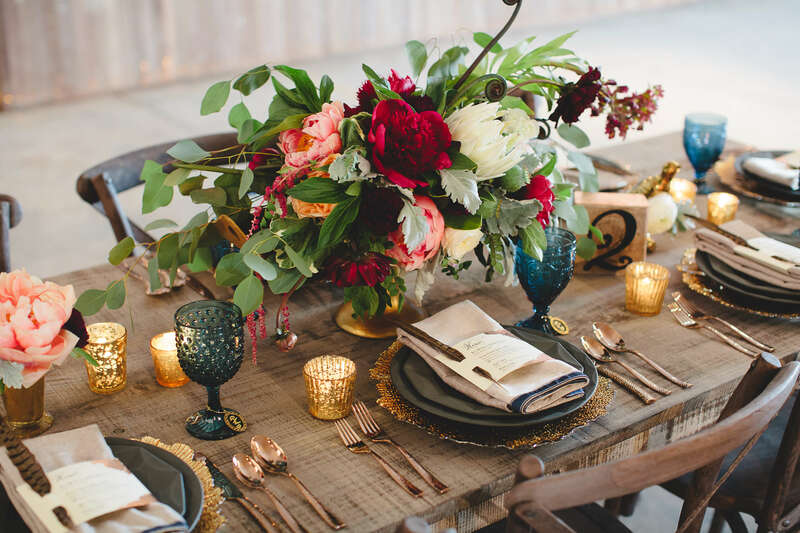 We’re so excited to finally be able to share our Cocktails and Crushed Velvet Styled Shoot with Willett Photography at The Stave Room at American Spirit Works! 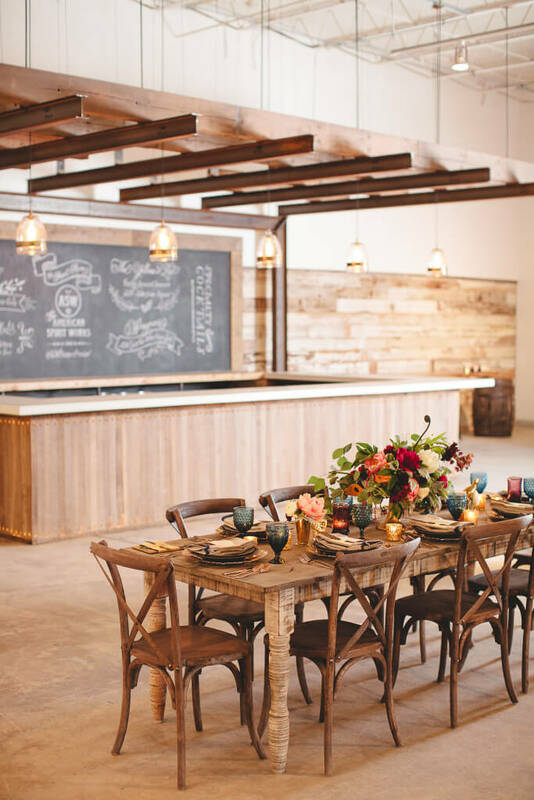 We teamed up with some of Atlanta’s best wedding vendors to dress up this newly renovated venue with a design that’s a little bit edgy and a little bit glam! 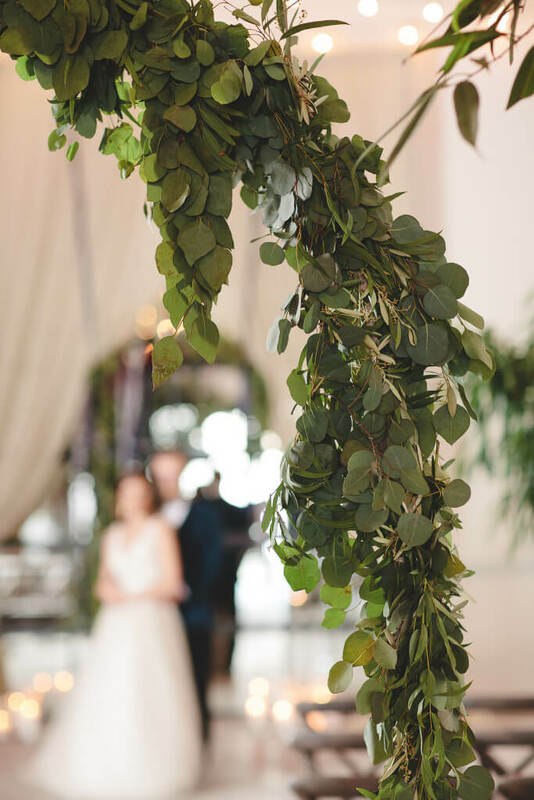 With the help of stunning draper from Unique Event Elements, we transformed the urban courtyard into a romantic wedding ceremony complete with a whimsical greenery arch from Juli Vaughn Designs welcoming guests into the ceremony space. Have you ever seen a better dressed couple? 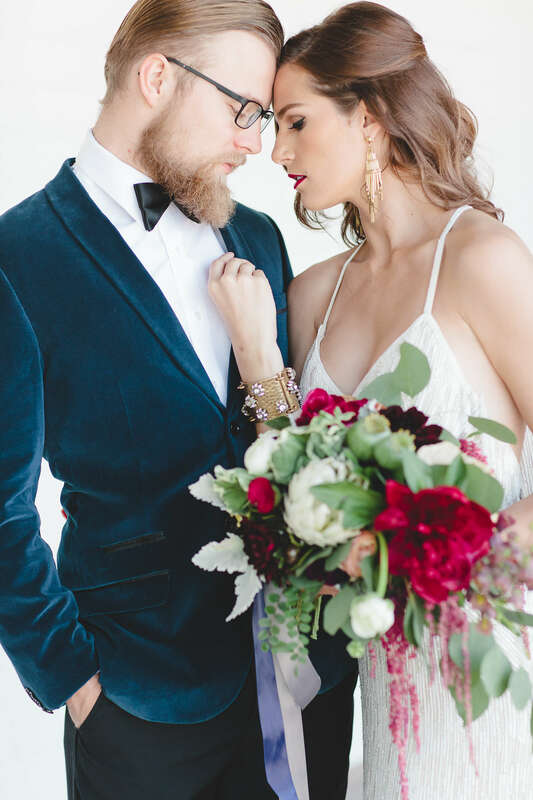 The Modern Gent styled our groom in a blue crushed velvet jacket and black pants while the bride wore two Anne Barge gowns that each had that ‘wow’ factor! Not to mention the beautiful hair and makeup from Scoobie West & Co! And that bouquet! 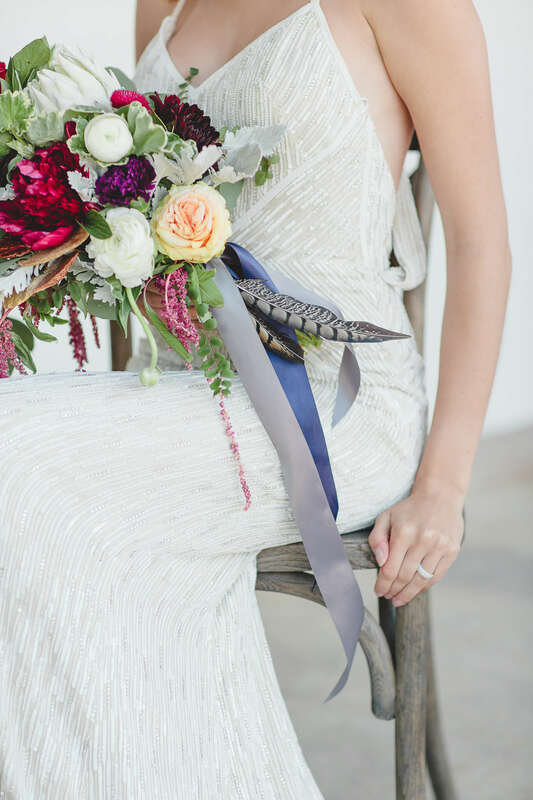 Never has protea looked so good! 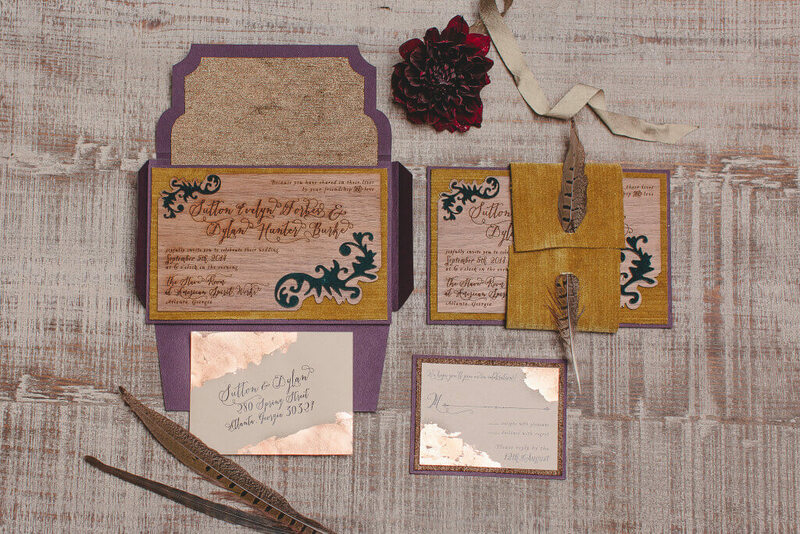 Hi Note went above and beyond on all the stationery featured in the shoot, especially these laser cut wood invitations with crushed velvet cutouts and copper foil. This was seriously one of the most amazing pieces ever created! This table. Oh, this table. I want this in my house! This tablescape embodies everything mixed metals should. 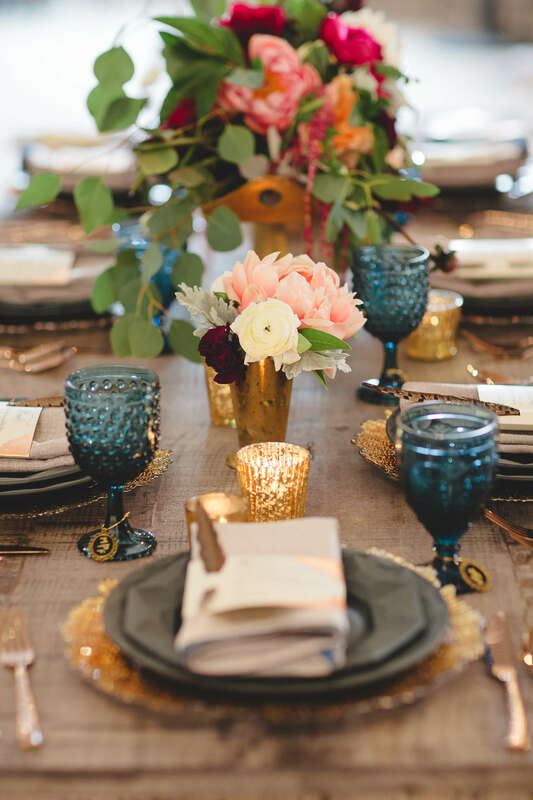 Starting with the in-house farm table and cross back chairs from The Stave Room, we paired gold starbust chargers from Event Rentals Unlimited with slate Kate Spade plates, copper flatware that was to die for, and rich blue textured glassware! 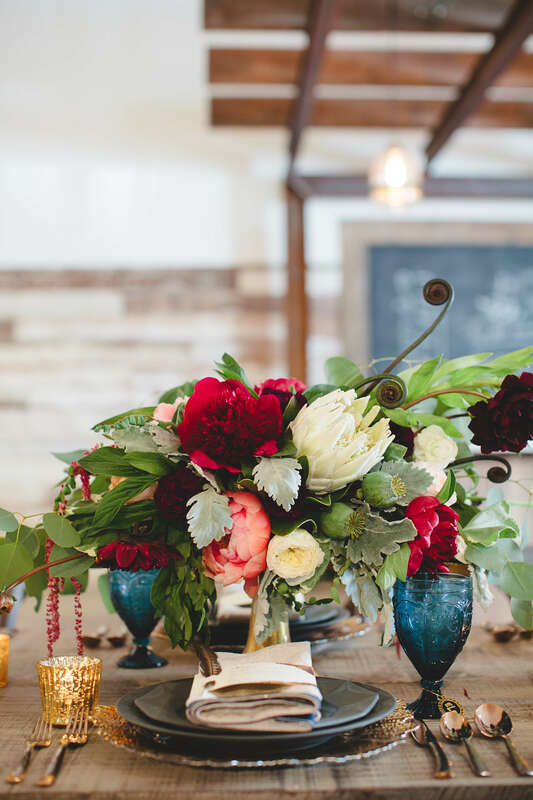 Bre with Juli Vaughn Designs brought it all together with an out-of-this-world arrangement packed with texture and color. 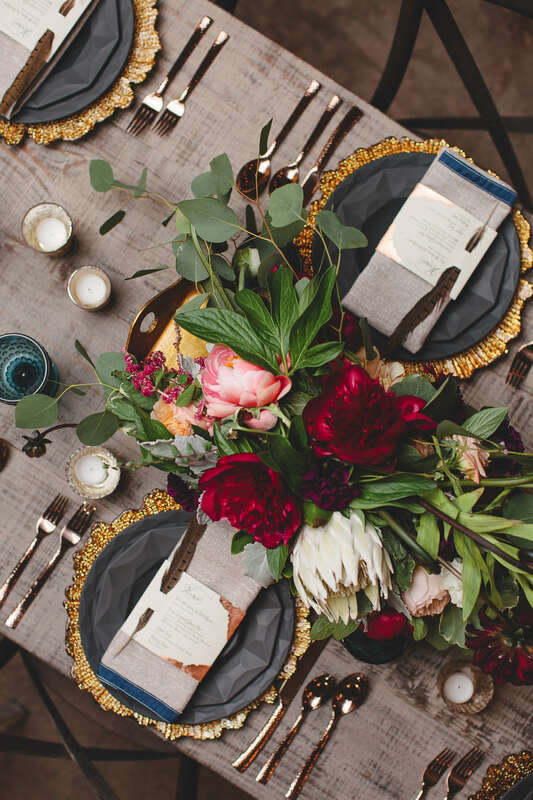 Everything was capped off with a flax metallic napkin from Nuage Designs wrapped with a Hi Note menu accented with a pheasant feather. 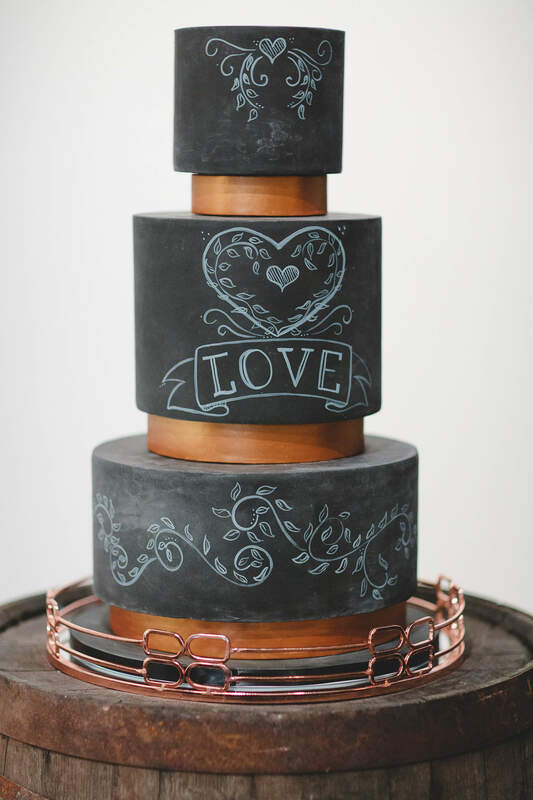 Drawing inspiration from the oversize chalkboard behind The Stave Room’s built-in bar, For Goodness Cakes created a decadent chalkboard cake featuring metallic copper tiers for added elegance. 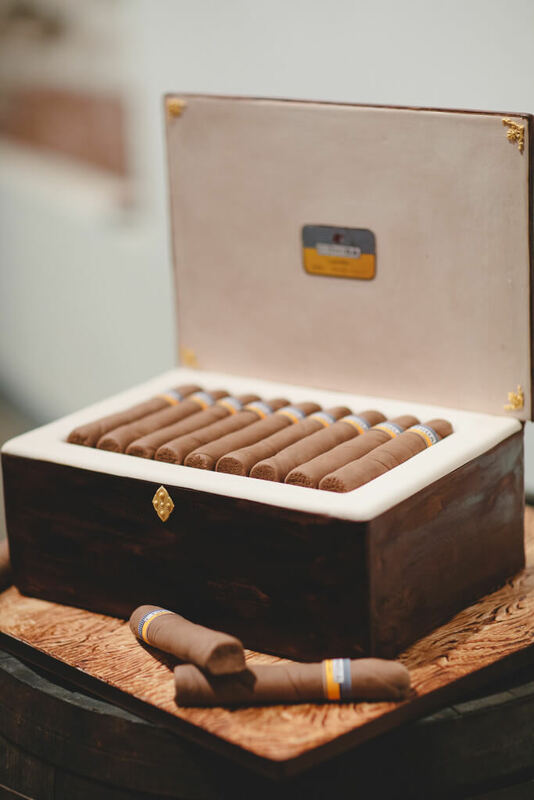 Let’s not forget the insanely realistic cigar box groom’s cake! 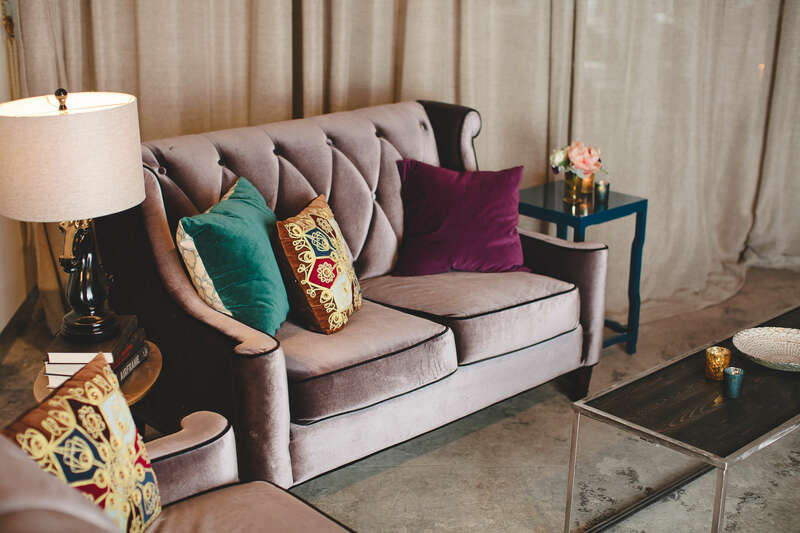 Collection Event Rentals provided gray velvet sofas and a hammered metal and wood coffee table to fit right in with this glam look. It’s easy to make any lounge look complete and welcoming by adding a few accessories you might have at home! 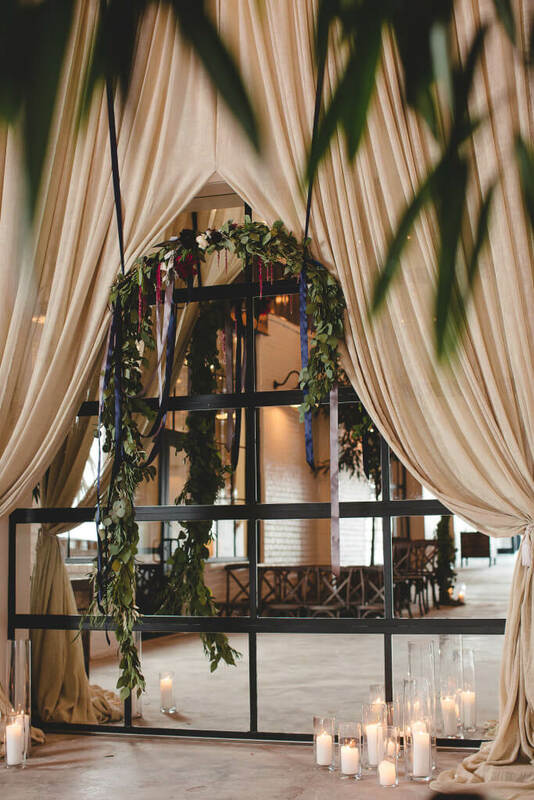 See more of our Cocktails and Crushed Velvet shoot featured on 100 Layer Cake and then let us know how we can help you with your wedding at The Stave Room at American Spirit Works!